Nokia Belle is the second big update to Nokia’s Symbian^3 operating system and it makes the dated UI look much better with more home screens, an Android-style pull down notification bar, resizable widgets and NFC support. Sadly, it was expected to arrive to existing handset in 2011 and now its delay is officially confirmed. Interestingly, Nokia has also dropped Symbian out of Symbian Belle which is now known as simply the Nokia Belle. We don't know what is the motif behind such a decision, but it seems that the Symbian name is not one Nokia and its CEO Stephen Elop are very proud of recently. 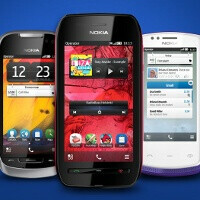 The Belle update arrived with three new Nokias: the Nokia 701, 700 and 603. It’s already being pre-installed on newly manufactured Symbian models like the Nokia N8, but for those of you who have previously purchased a Symbian^3 device, the update is only coming in February 2012. Some other visual enhancements shipping with Belle include visual multitasking, and toggle buttons for some common tasks like switching the Wi-Fi on or off. Overall, Belle is a nice polish of Symbian which does make it look much better, but when it comes to the menus, mail and other old drawbacks of the platform, they are still there. The only drawback that Symbian had was UI & Browser, which have been addressed with Belle... Don't be a biased reviewer! You're actually the biased fanboy here! No one gives a crap about Symbian anymore, the world is just all about Android, iOS and a little bit of WP. BB and Symbian are still quite popular in some Asian and European countries but they are slowly going down. Atleast Nokia is still supporting Symbian OS in its fading days. It is thanks to Google and Apple that Nokia took updates seriously. As i remember before, S60v3 devices were rarely getting any updates, perhaps 3 to 4 updates per models. Tech websites make you think that no one gives a crap about Symbian anymore, but in the real world atleast 350million Symbian devices are sold every year..... LOL! You just made urself look dumb. Most of you Americans have never used a Symbian powered phone, but you rear your head wherever you see the word "SYMBIAN"... It's still the MOST USED MOBILE OS in the world, don't let those formulated market share figures fool you. Android is growing, Yes, but ICS & further updates will limit it to only High-End devices... If not for contracts, how many people can actually afford to pay $500+ for a smartphone? WHERE IS THE NOKIA 500!!!?? ?